Sealaska Heritage Institute (SHI) will introduce several new events at Celebration 2018 in an effort to expand knowledge of cultural practices. New events include a regalia care workshop, a modeling workshop, a designer workshop, a Baby Raven Celebration, a film screening in Shuká Hít (the clan house) at the Walter Soboleff Building, a poetry gathering and three research projects. SHI this year also added a best seal oil category to its Native food competitions. Contestants may submit seal oil with or without crackling (fat). Judging for this and other food contests for best soapberries and black seaweed will be broadcast live at Centennial Hall this year. People competing for best soapberries also will whip up their dishes at that time. The event is scheduled from 12-1 pm, Thursday, June 7. SHI’s professional staff will lead a workshop discussing ways to care for, transport and store regalia. The workshop is scheduled from 10 am-12 pm, Friday, second floor, Walter Soboleff Building. Fashion show director Amber-Dawn Bear Robe of the Institute of American Indian Arts in Santa Fe will lead a model workshop at 4 pm, Wednesday, third floor, Walter Soboleff Building. The workshop is open to anyone interested in modeling for SHI’s Native Fashion Show at Celebration 2018 or for future shows. Later, Chilkat/Ravenstail weaver and former pro snowboarder Meghann O’Brien will lead a designer workshop for anyone interested in designing pieces for future fashion shows sponsored by SHI. The session will include discussion on Indigenous perspectives in fashion, weaving, and carrying tradition forward in a respectful way. Meghann is an immerging designer from the Haida and Kwakwaka’wakw tribes of British Columbia. That workshop is scheduled from 6-8 pm, Thursday, second floor, Walter Soboleff Building. SHI’s Native Fashion Show is scheduled from 6-7 pm at Centennial Hall. For the first time, SHI will host a film screening in Shuká Hít (the clan house) at the Walter Soboleff Building during Celebration. The film, Magnetic North: Nathan Jackson, is part of a documentary series exploring the personality and character of six Alaskans whose actions and ideas have shaped the history, spirit and values of our state. The film was produced by the Alaska Humanities Forum in partnership with the Rasmuson Foundation, and the screening will focus on a segment about Tlingit master artist Nathan Jackson, who will participate in a Q&A session immediately after. As in previous Celebrations, Gold Town Theater will also have film screenings, including Keep Talking, a documentary on Alaska Native language revitalization; and Journeys to Adäka, a documentary that follows seven Indigenous artists as they prepare for the Adäka Cultural Festival in Whitehorse, Yukon. SHI will also sponsor a poetry gathering, Singing Praises to You: Alaska Native Poetry. The event will include poetry and performance and feature a special tribute to the late poet Nora Marks Dauenhauer. Featured poets include Robert Davis Hoffmann, Ishmael Hope, X’unei Lance Twitchell, Vivian Mork and host Donna Beaver. The gathering is scheduled from 7-9 pm, Friday, at Shuká Hít (the clan house) at the Walter Soboleff Building. SHI will sponsor a Baby Raven Celebration as a part of its Baby Raven Reads program; this event is open to all families with children ages 5 and under. Families are invited to dance, sing, and play at Shuká Hít (the clan house) from 12:45 -1:45 Friday, at the Walter Soboleff Building. Book distribution to follow. SHI will host three research teams enrolled in the institute’s Visiting Scholars Program during Celebration. Visiting Scholar Torah Harding-Laman is of Tsimshian descent from Ketchikan. She is an undergraduate student conducting research on the revitalization of the Tsimshian language, Sm’algyax. Torah is looking for individuals to interview who have a connection to Tsimshian language or culture for her project. Anyone who has knowledge that might contribute to Torah’s research can find her from 10 am-12 pm and 2-4 pm, Thursday, Friday and Saturday, at the Elizabeth Peratrovich Hall. She can be reached at (907) 617-2003. 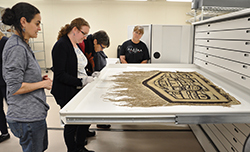 SHI also is hosting returning Visiting Scholars Dr. Caitlin Stern and Dr. Jessie Livia Barker, who are continuing their research into Alaska Native identity. They will have a table in the Centennial Hall lobby to interview participants in their project. Visiting Scholar Dr. Bronwyn Tarr is researcher from the University of Oxford, UK. Her work is about understanding the social and well-being effects of group dancing, and she is collecting stories from different dance traditions and cultural practices around the world. Dr. Tarr will be attending Celebration as a participant observer, but also hopes to meet and interview performers from several groups and members of the public. Caption: Regalia care workshop at Sealaska Heritage in 2016.